Please, please, please, has anyone tried this in DS4? I want it, but only if it works in DS4. You need DS4.5. Everything is in .duf file format. Thank you. Oh well I'll save my money then. We are told that the Legacy file is for DS4, So it would seem that it should work. I purchased the pro bundle (I have been doing 3D rendering less than a year, and don't own any of the previous horses, so the new horse made sense for me), along with the extra discounted-if-in-the-same-cart-as-the-pro-bundle items. 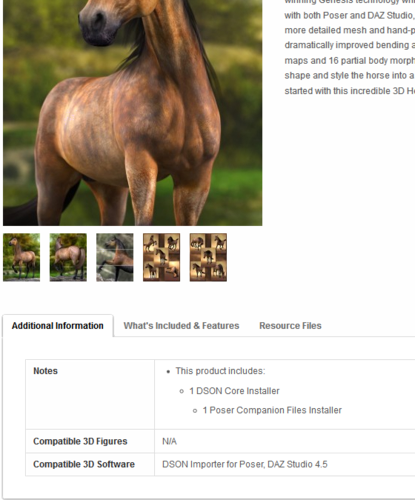 I just went back and checked all the items in "My Downloadable Products" and NOTHING has a Legacy file download listed; not even the base DAZ Horse 2 itself. Everything is DSON and PCF. So unless DAZ missed the legacy files in the pro bundle (possible, considering the other errors already reported with the files in the pro bundle), the new horse is for DS4.5 or higher only. Even if the base figure had Legacy support, with none of the other stuff having Legacy, it would be greatly hobbled in DS4.0. What about DS3? Will the legacy files work? So it will work in DS4. Yes in DS 4 but not in DS3, sorry about that. Cant we just load them side by side in DS and copy UV's from the original Horse to the new one? Or use use use a modeling / uv app to swap UV's? I have done this before on other figures with success. I really like the horse. It is sitting in my cart right now. I'm thinking about it. I don't use the old Mil horse anymore. It looks really dated to me, (as does the cat and dog) so I probably WOULD use this version, since it looks great, particularly the mane and tale which was a real handicap in Mil Horse. What I can't wait to see are poses with the saddles and bridles I see there are some for genesis, but fitting saddles and bridles to hands were a real pain with gen 4. I am also debating the cost of just buying the horse ala carte versus the basic bundle. I want the saddle/bridle , but don't really need the barn, shoes, or accessories, even though they are nice. I tend to do contemporary/sci-fi renders so armor is not useful at present. I am kicking myself for using my WELCOME coupon for 30% off on a bundle earlier this week and missing out on adding that to the new horse set. I also am tempted by the texture set, but 20.00 is more than I can afford right now for a skin- albeit a beautiful one. Doesn't say about the Legacy Installer on the page I see. Sorry don't know why it's gone blue. I can't justify the price of the pro bundle for the work I'd be doing with the horse -- but what I really want is the draft horse and the donkey, so It looks like I'll need to get the pro bundle. I do expect to see a fair number of animals based of the horse as time goes on . . .
That's not a bad price considering what I've got for the money. Haven't had chance to play as I'm reinstalling my computer. I have had the chance to play a bit, and the results are ... interesting. Yes, that's the word. Interesting. You have to use the scale dials as well as the bend/twist/side-side sliders to pose the reins and the stirrups to match the various rider poses. Use the Z-scale to shorten the stirrup leather, not the Y-scale. The whole process is weirdly fiddly, but possibly slightly easier than the old tack. Possibly. Also, is there some way to shorten the mane? When you click the "Mane run" toggle, it sweeps back and it looks great. It also goes right through any character on the horse's back and obscures their face from one direction or the other. Using the Surfaces tab kinda sorta helps, but it also renders part of the mane along the neck invisible, which really isn't what you want. You bought the pro bundle And the english saddle textures? English saddle textures are already in the pro bundle if I'm not wrong. WOW Pen, you stil got your PC coupon? Good for you! Got the pro bundle plus equestrian props and the knightly barding textures all for $49.13, not bad I'd say! it really helps to be a plat club member as the base price went down from like $87 (i think that was it?) to about $52. really wish we could use Milhorse textures as i have nearly all of cwrw's ones (which are AMAZING!) but hopefully someone will convert them. I was surprised to see the textures aren't backwards compatible like how Genesis can use V4.. Except it's a horse and can't do all that. There are some toonified animals coming out but this horse is definitely not intended to be a cat or dog. I believe the horse can probably be morphed into nearly any hooved animal since its based off of Genesis, and I'm really excited to see what the PAs come up with. ohhh, maybe a wolf morph for that too! I wonder how the horses UV's are though, can it support more uv's so people could have UV's optimized for creatures with different shapes? Can't wait for the next dog. Even though I already have the old dog and some poses/materials I love dogs enough to fork over $$ for a new one. But yeah it needs a ton of morphs and wolves are certainly some of them. Wake me up when it's a cow. Naw. It will be more than 30 days. Like ... 32 days from now. And it will be 90% off. Pawed animals might be possible with geografted paws. But I think the real distinction comes down to the rigging. The bone structure of a hooved animal with long grazing neck might not work so well for other animals like cat/dog, where the shoulders/arms come more alongside the body than they do in hooved animals. I did not think the textures were in there lol ... That will teach me to order after work when I'm tired. Yeah...I was holding onto it hoping for the teenage shapes! Thanks Jeanne! Hopefully it won't take too long.